There’s a story here you’ve probably heard before, about how these fish—you might call them red salmon, blueback, kokanee—magnificent in numbers off the coast of Alaska, especially near Katmai National Park, return home. This story has social currency. We use it to analogize just about everything. But, it is a marvel. Born in freshwater, these salmon migrate to the ocean as juveniles, travel thousands of kilometers. They feed, and grow, and eventually return to their natal river, upstream from the ocean (we call this anadromous), the very place of their birth, to spawn and die (we call this semelparous). Think about that: they return to the place of their birth to die, anchored by some innate desire to come home. But, see, this is only part of the story. Because the salmon, in turn, in their thunderous swarms, are integral to the propagation of other life in Katmai, too. Take the peninsular grizzly (ursus arctos gyas). The winters in this part of the world are long, stretch nearly seven months. When the bears emerge from hibernation, they are withered, skeletal. The scraggy mamas and their still-plump cubs search out nutrients, and in fits of hungry desperation eat sweet-grass and dig up clams from the wet-sand beaches. And they persist, they do, despite the lethal males. These are some of the largest bears in the world, one of the densest populations of grizzlies anywhere. Then spring: the sky is a spectrum of polished blues, mountains rising like ziggurats from the earth in all directions, peaks cloaked by downy-white clouds, all surrounded by sweet-smelling emerald forests of black spruce and cottonwood and quaking aspen, sitka and alder. 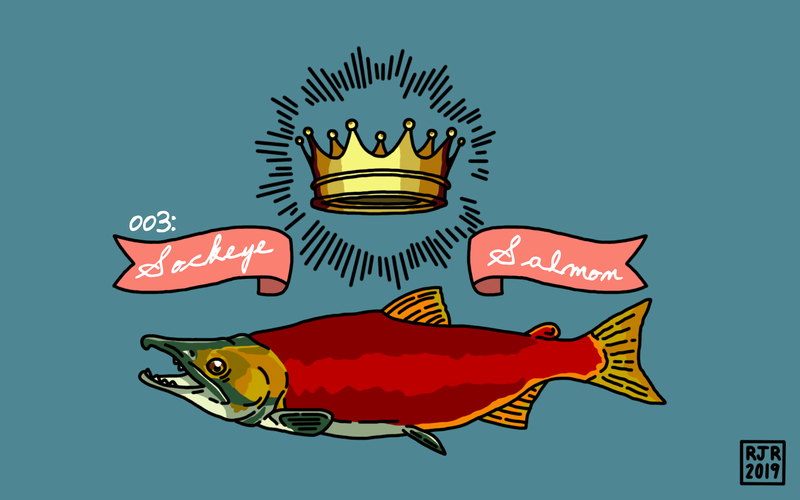 And then the salmon come back. It’s what the grizzlies are waiting for, salmon by the thousands returning to their home rivers, fat and delicious, easy picking out of sparkling waters. But, see? The mama bears take their cubs to fishing spots where their own mothers took them when they were young. They, too, return home, come here to devour salmon, to ensure their children’s survival (much like the salmon, giving their own lives so their eggs live on, hatch, migrate, return, return, return). Now the bears tolerate one another—there’s no time for fighting, only for gorging. Bears lie next to the water, lazily plucking up fish. They sit at the base of shady riverside birch and eat only the fatty parts, the brains and the skin, piling the carcasses in pink piles nearby. See? There is a story here you know. This place, this ecosystem, these bears, the salmon, and you. They’re unable to escape the pull of home, of passing something down. You thought, for a long while, that you could escape, that none of it mattered, where you came from. But still you went back twice in your life: at twenty-two, at twenty-five. You hated this place, the people, couldn’t understand how you were made here—you, you reasoned, didn’t belong. But each time you returned, you understood more. You peered through the cracks and saw what you’d missed all those years. You’re never more than six miles from a body of water, never more than eighty-five miles from a Great Lake. It has the longest freshwater coastline in the country. Autumn there is sublime, trees painted brilliant oranges and reds and golds. It’s home to cougars and dwarf lake irises and rainbow trout and gray wolves and loons and a thousand-elk herd flourishing in the Pigeon River Country State Forest. Our state tree is the Eastern white pine. Our state stone is the Petoskey. Our state dream is a still inland lake, a dock stretching out against it, our legs dangling off into the warm water while white-gray clouds glaze the sky overhead. Now, you see: there’s poetry in going home, in how far you’ve come, in your ability to change. Once, you never looked at the ground beneath your feet, all the beauty in a blade of grass, in a patch of dirt, the craggy bark of a passing tree. Now, like those salmon, like those bears, you gorge on this place and survive and thrive there. You realize what you’ve missed, and vow to never miss it again. God, it really is some almighty thing. Robert James Russell is the author of the novellas Mesilla (Dock Street Press) and Sea of Trees (Winter Goose Publishing), and the chapbook Don’t Ask Me to Spell It Out (WhiskeyPaper Press). He is a founding editor of the literary journals Midwestern Gothic and CHEAP POP. You can find his illustrations and writing at robertjamesrussell.com, or on Twitter/Instagram at @robhollywood.